For all you chocolate lovers out there, this melted mass is not quite in temper, but it’s close. Depending on the chocolate manufacturer, it could be in temper, but generally speaking 91 degrees is still a bit warm for dark chocolate. How do I know? I was a chocolatier for the last seven years and I learned a lot about process. Now I’m learning a lot of other processes. Chocolate, real chocolate, and not the candy melts. must be in a certain temperature range in order for it to set correctly, with gloss and snap. 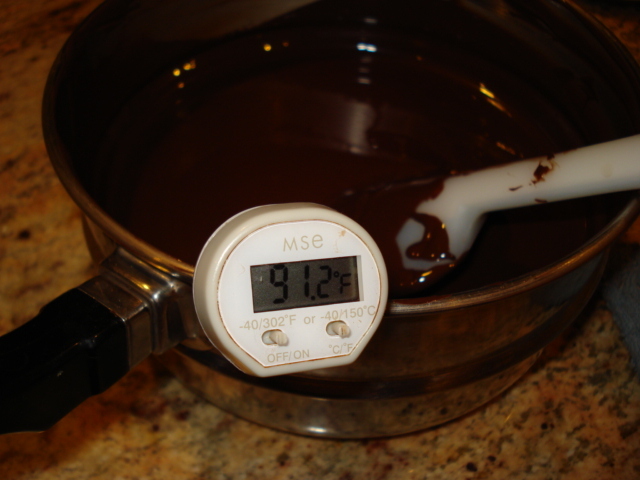 The tempering process, when done right, assures that the chocolate will set without what is called “bloom” (discolored streaks in the chocolate). The writing process and the road to publication is long, with many revisions and rewrites. My novel is still in that process before I even try to find a publisher. I want my novel to have the greatest chance to be published by a royalty publisher. Life is a process. From before we are born, we are constantly changing and growing. If we don’t continue to grow, we drift, then begin to die. Eventually we will all die. But for now – what stage of life are you in? What challenges have you overcome? Where are in the process (changing) and the progress (growth) of life are you? I hope I’m doing both at the same time. The last eight weeks have been a huge challenge to me, but I am making progress. My wrist is healing. I started out with a plaster cast, then a double splint, then surgical splint, and then a brace. I’m finally out of the brace, and in physical therapy. But even that is a process with progress. I will get full use of my wrist and hand back. It’s a process with progress. What’s yours? Leave a comment and let me know.